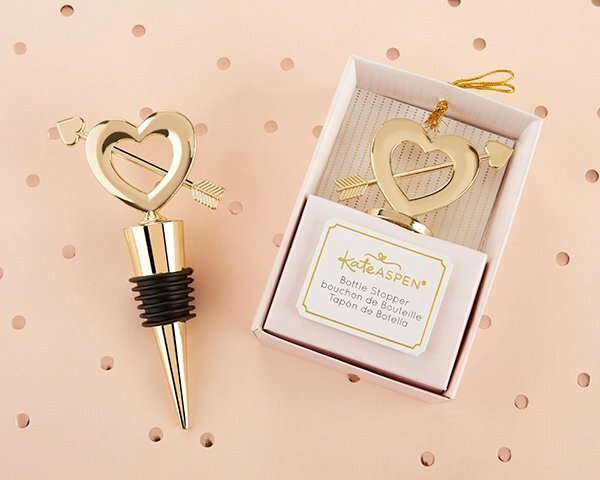 Kate Aspen's Cupid's Arrow Gold Bottle Stopper puts a little love in all of your favorite bottles! 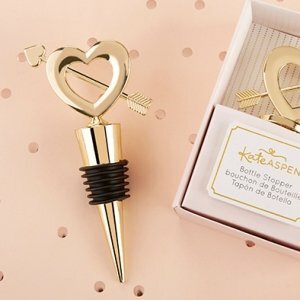 A stunning addition to wedding party gifts, welcome bags, and bridal shower game prizes, the gold bottle stopper is suited to fit any standard sized bottle neck. Keep wine bottles fresh with a bottle stopper favor that will remind you of the love shared on your wedding day! Shiny gold metal bottle stopper with open heart and arrow design on top. NOTE: Closeout Item. A minimum of 12 required for purchase. How can I personalize this for wedding favors? You need to add this Cupid's Arrow Gold Bottle Stopper Favor in your shopping cart to see the personalization options.